To celebrate we created a video. This is a celebration of the M60-A, inspired by a community of people that have allowed us to be at the center of their workspace. Featured in this video are the new M60 finishes, MILK and HAZE, and the STEALTH EDITIONS of MOON and KURO. We have a lot of new features and options available with the SEQ2 launch, including the new Internal Dampener and our new signature fixture series. All accessories are compatible with previous and future releases. We will be producing a video showcasing the differences of sound both with and without the internal dampener within the upcoming week! The KOYU will also be shipping with our new signature fasteners and will complete the look! PBT Heavy Industry is en-route to our warehouse where we will be shipping them out in the following weeks - we’re excited to see these adorned on some keyboards! All M6-B units have been shipped as of last week and we will have extras available this week! We have a number of units of the M60-A which will be first offered to the waiting list then open to the public shortly after. This is in very small supply. All M60-A enclosures have been completed and will be shipped by sea-freight to our Melbourne Warehouse. A little delay has occured due to the Mid-Autumn festival/National holiday but they will be returning in the next few days to promptly pack and prepare the shipping container for shipment. Sea-Freight will take around 2-3 weeks to arrive to our bays in Melbourne, Australia. We will then package and ship in batches of colour and country and aim to complete this over the course of a week with the help of a few hired hands. Meanwhile our team down under (Wilba, Kate & Rama) have been programming, testing and packing the PCB’s whilst we wait for the freight shipment of the M60-A enclosures to arrive. We appreciate the patience of everyone who participated in the pre-orders and we’re excited to see these unboxed and assembled in their own unique combinations. During our visit to our manufacturers we where lucky enough to see some of the M60-A’s undergo the anodising process. Here are some photos of the enclosures receiving their perfect colour. The jigs are all custom made to hold the enclosures in such a way to hide the anode mark. Anodising is all about timing and craftsmanship by extremely skilled workers. Seeing the process in person really makes you appreciate the beauty of chemical reactions much more. 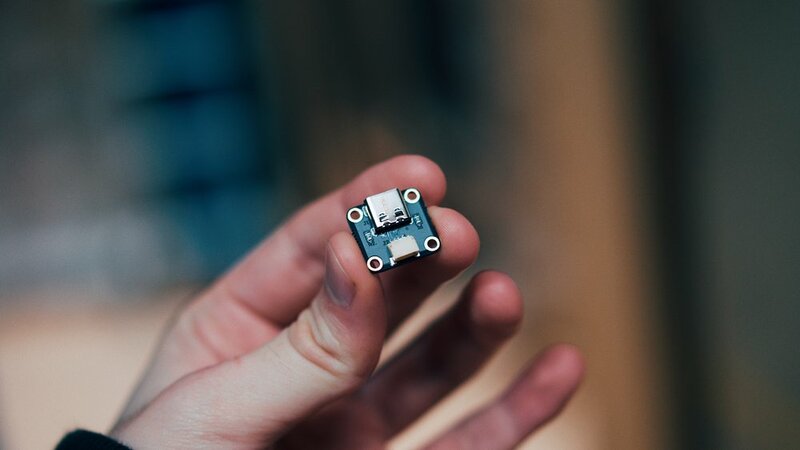 First the M60-A goes through a number of cleaning baths to remove any contaminates which may be present on the surface, it then is placed immediately into an ultrasonic bath for a matter of minutes and directly placed into multiple colour tanks where it quickly starts to show its colour. M6-B is well into production. We will be receiving the XO caps from Signature Plastics shortly, the PCB’s will be complete in 2-3 weeks and the enclosures after that. We have ordered many extras to stock on our site for those who missed out. Pas that, the new XO pins have arrived! This time we laser-cut them out of mirrored stainless steel. These are much tougher and cleaner than the first iteration. Our limited edition Type Hype caps are starting to arrive to our international customers, very happy with how our first enamel filled keycap came out. A lucky 2 orders will also be receiving an unreleased yellow-enamel filled variant, we hope to see it on a board somewhere! Introducing our latest keycap release with the latest GMK set, GMK Chocolatier. We are offering the Blue PVD coated X/O caps in Cherry Profile and a ‘Golden Ticket’ in Gold PVD! These are available through various vendors who are offering the keyset. We finally launched the Heavy Industry keyset to be paired with our latest offerings, the KOYU and M60 keyboards. Check it out through the link below! It is also suited for other products on the market and can be accented with the yellow or more subtle without. New renders have been uploaded to their respective KOYU pages to show the colours of the board in its various colours. We’re on Apple News! If you own an iOS device subscribe to the “Rama Works” news channel and follow these updates from there also. Hey all! Apologies for the late update, been meaning to post one for a while but caught up in accounting, unfortunately, always the things you don't want to do. But back to what we love now! All the m60-A PCB's are in as of last week. Currently unboxing them all and sending them in batches to our in-house Hardware Engineer Wilba to program and test over the next few weeks. They will then all be packaged and warehoused until the enclosures arrive. All M60-A enclosures are all machined and currently undergoing Anodising by colour batch. A few colours have already been completed. All PVD coating and hand-mirror polishing have been complete on the brass components. We estimate all enclosures to finish around early September - and we will be visiting our suppliers to do a final QC before they are forwarded to our warehouse for final assembly and packaging. We will be away for a week and a half from the first week of September and reachable via our contact support email: support@rama.works. Sea-Freight should take roughly 2 weeks and we will promptly pack each order in batches of Country, Colour and Contents. All stainless steel fasteners and black hex screws are in and we are also creating a manual on how to assemble the M60-A. Here is an artwork we commissioned by the very talented Janne Iivonen which will be used as the front cover for the manual, it shows the diversity and playfulness we strive for within our products and customers. We are looking forward to shipping these out and seeing them customised in their own unique ways by the new owners! Excited to launch the new variation of the M6-B, it includes all the great features of the previous revision but now with RGB lighting! The PCB is also backwards compatible with any existing M6 enclosure. The new variation on the coveted wave keycap series. Available for preorder now alongside the M6-B. The 'Project Updates' blog is now 'Proto(Type)' It is what identifies us across our spectrum and excites, mesmerizes and captivates our audiences. It's us on a page. More to come.